Rumania's Communist dictator from 1965 - 1989, Nicolae Ceausescu, and his wife and second-in-command Elena, were prosecuted by the National Salvation Front in a secret trial, held on a military base near Tirgoviste, Rumania, on Christmas Day, December 25th 1989. General Gica Popa was the prosecutor. Below are the officially reported transcripts. UNIDENTIFIED VOICE: A glass of water! 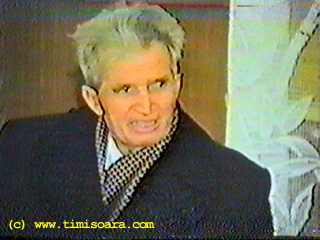 NICOLAE CEAUSESCU: I only recognize the Grand National Assembly. I will only speak in front of it. people, but he only tyrannized the people all the time. You are faced with charges that you held really sumptuous celebrations on all holidays at your house. The details are known. These two defendants procured the most luxurious foodstuffs and clothes from abroad. They were even worse than the king, the former king of Rumania. The people only received 200 grams per day, against an identity card. These two defendants have robbed the people, and not even today do they want to talk. They are cowards. We have data concerning both of them. I ask the chairman of the prosecutor's office to read the bill of indictment. who have committed the following offenses: Crimes against the people. Genocide, in accordance with Article 356 of the penal code. Two: Armed attack on the people and the state power, in accordance with Article 163 of the penal code. The destruction of buildings and state institutions, undermining of the national economy, in accordance with Articles 165 and 145 of the penal code. They obstructed the normal process of the economy. PROSECUTOR: Did you hear the charges? Have you understood them? CEAUSESCU: I do not answer, I will only answer questions before the Grand National Assembly. I do not recognize this court. The charges are incorrect, and I will not answer a single question here. PROSECUTOR: Note, he does not recognize the points mentioned in the bill of indictment. CEAUSESCU: I will not sign anything. is nothing to eat, no heating, no electricity. NICOLAE CEAUSESCU and ELENA deny this. PROSECUTOR: Who ordered the bloodbath in Timisoara. PROSECUTOR: Who gave the order to shoot in Bucharest, for instance? CEAUSESCU: I do not answer. PROSECUTOR: Who ordered shooting into the crowd? Tell us! PROSECUTOR: Do you not know anything about the order to shoot? or are you paying them? PROSECUTOR: By now, there have been 34 casualties. ELENA: Look, and that they are calling genocide. municipalities, there is shooting going on. The people were slaves. do anything for you anymore. The accused should tell us who the mercenaries are. Who pays them? And who brought them into the country? correctly, but she calls herself a university graduate. PROSECUTOR cites all academic titles she had always claimed to have. our questions. What prevents him from doing so? Grand National Assembly -- no one else. PROSECUTOR: The world already knows what has happened here. CEAUSESCU: I will not answer you putschists. PROSECUTOR: The Grand National Assembly has been dissolved. Front is now our supreme body. forum. I do not recognize the court. and against this putsch, against this usurpation. CEAUSESCU claimes the putsch was organized from abroad. CEAUSESCU: I do not recognize this court. I will not answer any more. and for the destruction of Rumania. whether Ceausescu wants to, should, must or can answer at all. chief of the Rumanian army. No one can deprive me of these functions. PROSECUTOR: What are you really? PROSECUTOR: Yes, but you are paying the mercenaries. ELENA: It is incredible what they are inventing, incredible. to be the country's president and the commander in chief of the army. Why did you ruin the country so much? Why did you export everything? provinces to Bucharest and to the other cities in order to buy bread. eat. Why did you starve the people? there is, how many treasonable offenses were committed. The prosecutor quotes Ceausescu's program. villages and the Rumanian soil. What do you say as a citizen? guaranteed that every village has its schools, hospitals and doctors. in the country, like in no other country in the world. PROSECUTOR: We have always spoken of equality. We are all equal. pictures from your luxurious celebrations. CEAUSESCU: No, we had no palaces. The palaces belong to the people. in the palaces of the people. CEAUSESCU: Is it possible that we are facing such charges? PROSECUTOR: Let us now talk about the accounts in Switzerland, Mr.
Ceausescu. What about the accounts? ELENA: Accounts in Switzerland? Furnish proof! what provocations! This was a coup d'etat. Switzerland should be transferred to the Rumanian state, the State Bank. will not say anything here. This is a vulgar provocation. PROSECUTOR: Will you sign the statement now or not? CEAUSESCU: No, no. I have no statement to make, and I will not sign one. CEAUSESCU: I do not recognize this new forum. PROSECUTOR: So you know the new forum. 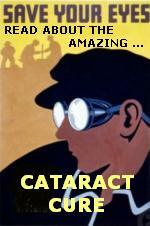 You have information about it. ELENA & NICOLAE: Well, you told us about it. You told us about it here. CEAUSESCU: Nobody can change the state structures. This is not possible. cabinet, in the government. Did you know about the genocide in Timisoara? ELENA: What genocide? By the way, I will not answer any more questions. only deal with polymers? You, as a scientist, did you know about it? CEAUSESCU: Her scientific papers were published abroad! PROSECUTOR: And who wrote the papers for you, Elena? the Academy of Sciences. You cannot talk to me in such a way! will not answer a single question. ELENA: The terrorists are from Securitate. PROSECUTOR: The terrorists are from Securitate? PROSECUTOR: We are finished with you. You need not say anything else. The next question is: How did General Milea [Vasile Milea, Ceausescu's Defense Minister} die? Was he shot? And by whom? ELENA: Ask the doctors and the people, but not me! CEAUSESCU: I will ask you a counter-question. Why do you not put the question like this: Why did General Milea commit suicide? PROSECUTOR: What induced him to commit suicide? You called him a traitor. This was the reason for his suicide. 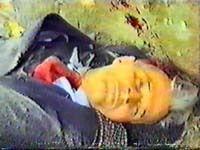 CEAUSESCU: The traitor Milea committed suicide. PROSECUTOR: Why did you not bring him to trial and have him sentenced? PROSECUTOR: What were his criminal acts? 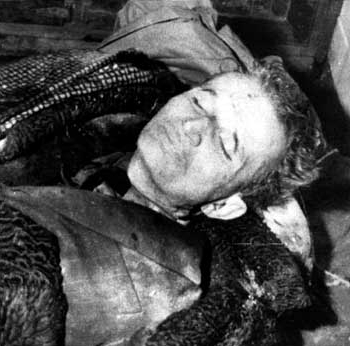 CEAUSESCU: He did not urge his unit to do their patriotic duty. that General Milea had committed suicide. PROSECUTOR: You have always been more talkative than your colleague. are members of the Academy of Sciences. works of the so-called Academician Elena Ceausescu. obeyed your orders. What orders? will say in which way he betrayed his fatherland. ever had a mental illness. CEAUSESCU: What? What should he ask us? PROSECUTOR: Whether you have ever had a mental illness. CEAUSESCU: What an obscene provocation. illness and admitted this, you would not be responsible for your acts. CEAUSESCU: I do not recognize this court. PROSECUTOR: You have never been able to hold a dialogue with the people. attempt. Do you want to sign this statement? cooperate with the court-appointed counsel for the defense. not betray our people here. follows the reading of the indictment. entire property of the two accused. they should accept this right. Nicolae Ceausescu should be punished in a really legal trial. the former positions of the two Ceausescus are no longer valid. must receive due punishment for the offenses he has committed. months, the whole of Bucharest. ELENA: Whom are they talking about? guilt. You should have stayed in Iran where you had flown to. ELENA (laughs): We do not stay abroad. This is our home. into the courtyard and executed by firing squad. 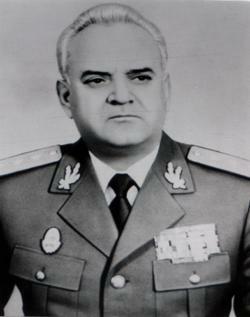 The Prosecutor, General Gica Popa, died within three months, in March 1990. His death was reported to be a suicide.